In this post, “Social Media: Medical Social Networking – Part 2,” I give examples of medical professionals and hospitals engaging in social media, useful health sites and online communities for patients and more. HOW ARE MEDICAL PROFESSIONALS USING SOCIAL MEDIA TO IMPROVE PATIENT CARE? ARE HOSPITALS EMBRACING SOCIAL MEDIA? WHY ARE PATIENTS SO RECEPTIVE TO SOCIAL MEDIA? WHY DO PATIENTS ENGAGE IN HEALTH COMMUNITIES AND WHAT KINDS OF COMMUNITIES ARE OUT THERE FOR PATIENTS LOOKING FOR SUPPORT? WHAT IS THE BEST ADVICE FOR PATIENTS TO GET THE MOST OUT OF THEIR HEALTH CARE? Social Media is a powerful and phenomenal platform to educate patients. Social Media can help raise awareness of health issues and it offers a forum to collaborate and connect. Social Media gives a voice to patients and it allows for the conversation to get started with their doctors and other health care professionals. Health information is communicated in real-time and in a transparent style. Health Care is about the patient, the most important member of the health care team. Patients want accurate, trustworthy and transparent health information. 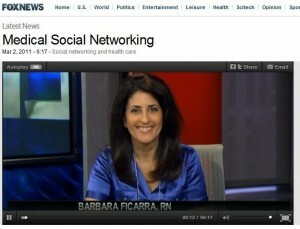 Social media allows doctors and other health professionals to engage and share information. Social Media is all about connection, collaboration, community, respect and patient engagement and empowerment. Some medical professionals are using social media, such as Facebook, Twitter, You Tube, and Blogs to connect with patients to share trusted and accurate health information and to empower patients to be proactive in their health. Others use it to simply collaborate with colleagues by exchanging journal articles and some medical professionals use it to “brand” their practice or highlight their latest book. There are outstanding doctors, nurses and other health professionals using social media. 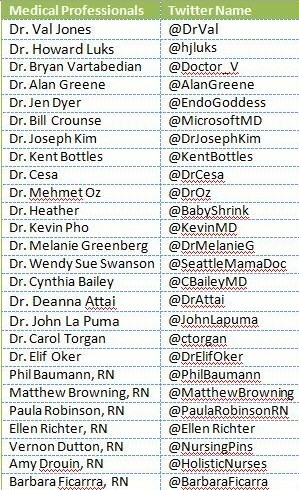 To find out which doctors, nurses and other health professionals are using twitter you can find a comprehensive list of stellar health professionals at Mashable and OrganizedWisdom. From dermatologists to endocrinologists to nurses, life coaches to health IT experts to health communicators and patient advocates; OrganizedWisdom lists these great groups of professionals plus many others. Additionally, Dr. Val Jones, founder of Better Health network highlights an outstanding group of health professionals’ blogs. Additionally, Sean Gardner (@2morrowknight), Joyce Cherrier (@JoyceCherrier) and Sung Lee (@Sung_H_Lee) are great folks who tweet and retweet about health. Doctors, nurses and other health professionals aren’t the only ones using social media, some hospitals are embracing this powerful platform. Big companies have a message to share and health care professionals can tap into what these fortune 500 companies are doing and learn from them. Medical professionals have a message to share as well—whether it’s sharing a blog post, communicating late breaking health news or simply sharing health information that can help improve lives or raise awareness; social media taps into the lightning fast world of real-time information. If you’re wondering what hospitals are engaging in social media, Ed Bennett, web manager at the University of Maryland Medical Center (UMMC) complied a comprehensive list, the Hospital Social Network List. It’s easy to find hospitals by state that use Twitter, Facebook, You Tube, Blogs, Linkedin, and Foursquare. For example, since I’m located in New York, I’m curious about which hospitals engage in social networking. According to Bennett’s list, there are 95 hospitals that are on the cutting-edge using social media to engage their patients. 45 of those are on You Tube, 85 are on FaceBook, 52 are on Twitter, 66 are on Linkedin, 79 use Foursquare, and 5 of these hospitals have blogs. When you click “New York” you will come across the comprehensive list of hospitals engaging in social media. I am surprised that there are not more hospitals with blogs. Patients are receptive to Social Media because today’s patients are smart and technology savvy. Today’s patients are empowered and they are known as the “e-patient”— Dave deBronkart, (e-patient Dave) diagnosed with advanced kidney cancer quickly became engaged in the internet searching desperately for health information and support. He became an empowered and engaged patient surrounding himself with invaluable information and support. Patients are using the internet to gather health information. In fact, in a Pew Internet Study, 60% of e-patients, access social media related to health. Patients want a relationship with their doctors and health care providers. They don’t want to be told what to do; instead they want to work together with their providers to develop a plan that meets their needs. The reasons health consumers engage in health communities are simple. They are looking for emotional and informational support. By engaging in online health communities many people find the emotional support they are looking for. They find reassurance from other people going through the same experience. They can collaborate and share information. They gather health information from various sites to help them gain knowledge. A couple communities are Inspire.com and PatientsLikeMe.com. Let us know what health communities you engage in. Share your insightful thoughts in the comment section below. The best advice for patients is to be proactive in their health. It’s important to be an empowered patient and to always take charge of your health. Patients need to have a good relationship with their doctors and other health care providers. They need to speak up and ask questions. By searching online for health information, reading blogs from outstanding medical professionals, being part of patient online communities; can aid in helping patients learn the right questions to ask and to get the answers they need. Be smart and savvy and be empowered—do your homework—research accurate and trusted sites—gather health information and talk to your doctor. Social Media gives patients a voice and helps get the conversation started. It’s important for doctors, nurses and other health professionals to understand that Google, Twitter, Facebook and other social media sites, health news and information sites and online patient community sites will not replace them. It’s simply a tool that offers additional information, and it allows the conversation to get started between health provider and patient. Doctors, nurses and other health providers need to engage in social media platforms to help educate the health consumer. They have the power to provide accurate, reliable and truthful information. They should not shun away from the internet but embrace it and join forces with the health consumer. Partnering together is a very useful since patient empowerment and patient engagement is essential in the doctor/nurse–patient relationship. Social Media starts the conversation, but face-to-face communication with your doctors and other health care professionals remains paramount. If you’re still unsure about embracing social media, Phil Baumann offers a widespread list for the 140 health care uses for Twitter. We would love to hear from you. Please share your insightful thoughts in the comment section below. If you’re a medical professional, are you embracing social media? 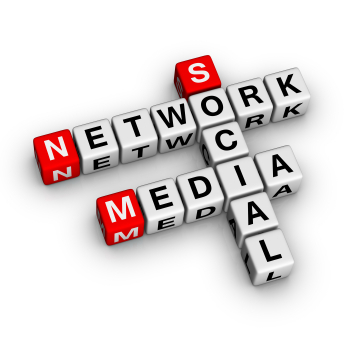 Health Consumers and patients, how do you engage in social networking? Is it helpful? Great article with a great summary of resources. I would love to have you come and discuss this at a HealthCamp (http://healthca.mp) event. Thank you so much Mark! I would love to! Thank you very much! I would love to! Thanks so much! Thanks for sharing the link for Susannah Fox at Pew Internet-I appreciate it. Pew Internet conducts great research. Good summary, Barbara – thanks! Not mentioned here, though, is that while social media makes communications better and easier among professionals, and between professionals and patients, it also means that we can’t just let down our hair with an “anything goes” attitude that seems to be so very prevalent in much of social media. As you know, I write for patients and focus on how they can empower themselves. I am now recommending they comb social media to get a better sense of their provider’s personalities and attitudes to be sure it’s a relationship they want to develop – or keep. That will either be good news or bad news for professionals who spend a lot of time with social media. I hope it will help them realize that being helpful goes much further than obscenities or wise cracks. I’ve seen both approaches. Social Media is informal communication; however maintaining a professional and comfortable relationship with your health care provider is essential. Thanks again Trisha, I’m a huge fan of your work! Thanks for sharing the link about hospitals in Europe using Social Media–“Based on the latest review the Netherlands still are leading in the use of SoMe in Europe, and the overall use of it is taking off. :—Very interesting! For people who live with diabetes (any type) and those who care about and for them, check out the weekly Twitter chat, Diabetes Social Media Advocacy, on Wednesdays at 9 pm EST. Follow hashtag #dsma for a fast-paced hour of questions and responses from member of the diabetes online community. Thank you so much for sharing the information about Twitter chat for Diabetes Social Media Advocacy. I appreciate it very much. Barbara – this was a great summary and a nice review of an evolving field. As a physician, having a presence on social media sites has helped me develop a more focused voice for my practice, as it has expanded my audience beyond my consultation room. I also agree with Trisha Torry’s comments – patients should be using all available tools to find the right physician. The doctor-patient relationship is an investment of time and trust – as a patient the more you know up front, the more comfortable you will be entering into that relationship, and the more successful that relationship will be. Barbara..excellent article and accurate as far as it goes but the picture you paint is only a very small slice of the health care pie. As a pr consultant with several health care clients, I can tell you that most doctors, nurses, podiatrists, and other health care professionals do not use social media in the way it’s intended. 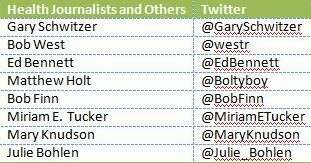 And I would argue that most of the hospitals mentioned in Ed’s list have only Youtube pages (which really aren’t social or interactive in most cases) and they use Twitter and Facebook to push our their news releases and engage in one-way conversations. The fact is that a lot of health care professionals dont like social media (or even email for that matter!) and we need to look at new strategies to help doctors and others truly embrace it. Health care has always marched to a different drummer on marketing trends and social media isn’t much different. I think we need to start exploring this nuance and stop talking about the minority of docs who do use it. It’s time to start a new dialogue on social media and health care professionals. Great post Barbara, thanks for compiling this list of resources. It is great to see so many medical professionals embrace social media, notably for sharing real-time information. At the end of day, healthcare is about collecting, processing and disseminating information, and the adoption of new technologies by primary and acute care providers will enhance the efficiency and quality of care. We are noticing the same social media trends in Canada, it seems that every hospital now has a Youtube channel and more and more physicians are blogging and “tweeting”. The benefits (or ROI for the hospital CFOs out there) is still not clear, but that will come with time. Your post highlights some of the early benefits, but they are just the tip of the iceberg. As more and more medical professional jump onboard, we will learn more about the true potential of the social web and its impact on healthcare. One strong request or recommendation when a health-care facility or provider uses social media: Remember that not all internet users are without disabilities. Many use assistive technology, such as speech recognition and screen readers, to access their computer. Most websites and social media are not accessible to persons with disabilities – perhaps, ironically – but this can cause further health-care disparities for those most at risk: people with sensory or physical impairments that impede their full access to information (in print or digitally). At Johnson & Johnson, we communicate with consumers and the patient community through blogs (JNJ BTW, Kilmer House), Twitter (JNJComm, JNJStories, JNJVideo, JNJHistory), and the Johnson & Johnson health channel on you tube, which I manage. On all our platorms, we try to provide useful healthcare and company-related information to help put a “human face” on our company. So far the response has been very positive and rewarding. The JNJhealth You Tube channel has well over 3-million views and JNJStories on Twitter has over 1000 followers, and our Facebook page has over 10,000 subscribers. nice and quite informative article. It has all the details that a health care consumer (and provider as well!) might be looking for before venturing into online media for addressing their health issues. I appreciate your thoughtful comments. 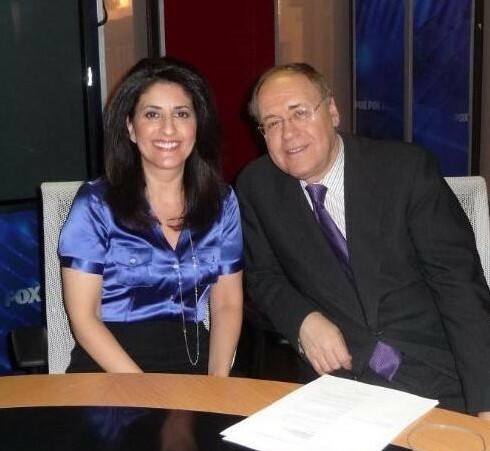 I agree, “The doctor-patient relationship is an investment of time and trust – as a patient the more you know up front, the more comfortable you will be entering into that relationship, and the more successful that relationship will be.” Respectful communication and collaboration with your doctor and other health care providers is essential. Here’s a post I wrote on the doctor-patient relationship: http://tinyurl.com/6bthbfj Thank you again for sharing your thoughts. Thank you so much! There are many doctors, nurses, and other health professionals that do use social media to share informative health information. You mention that you’re your experience you find that “most doctors, nurses, podiatrists, and other health care professionals do not use social media in the way it’s intended.” How are these professionals using it (from your experience)? Social Media in health care is very exciting, and it’s such a powerful platform. The opportunity for health professionals to engage in social media to help influence and to share critical health information is priceless. What recommendations do you have to “start a new dialogue on social media and health care professionals?” Thanks again. Thank you very much for sharing your thoughtful insights. I appreciate your comments—very interesting. Thank you very much for sharing your information. That’s great that Johnson and Johnson is embracing social media. Communicating with consumers and patient communities through social media is invaluable. Thank you Dr. Chopra for your kind words. I appreciate it!